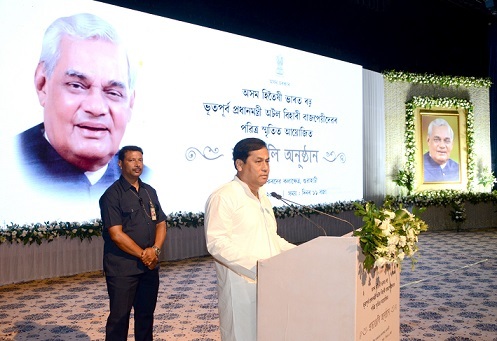 Assam Governor Prof Jagdish Mukhi and Chief Minister Sarbananda Sonowal on Monday paid rich tributes to former Prime Minister Late Atal Bihari Vajpayee at the ‘Shraddhanjali’ programme organised in his memory by Assam government at Srimanta Sankardev Kalakshetra. Saying that the former Prime Minister believed in dialogue and consensus to solve all problems, Governor Mukhi said that because of this reason he could sustain an alliance government. “Vajpayee’s oratory skills were exceptional and he demonstrated this while giving speech at United Nations in Hindi,” Mukhi said. Recalling the formers Prime Minister’s sense of humour as an asset in his repertoire, the Governor stated that Vajpayee would make witty remarks even in the tensest situations in the Parliament and it would relax the environment while bringing the discussion back on track. He was a parliamentarian per excellence and served in many capacities in the parliament as an MP, Mukhi highlighted. “Vajpayee’s pleasant demeanour inspired love and affection from all sections of the society as he commanded respect from people irrespective of their political ideologies,” Sonowal remarked. Quoting Vajpayee’s lines “I do not fear death but fear getting a bad name”, the chief minister highlighted the former Prime Minister’s contribution to Assam and Northeast in the form of construction of Bogibeel Bridge, linking the state with East West Corridor, setting up of DoNER Ministry among others. Following Vajpayee’s ideals the present Central government under the leadership of Prime Minister Narendra Modi is continuing with the developmental activities and people of the country must stay united to make India a developed country which would be the ultimate respect to the departed leader. Speaking on the occasion, Assam Finance Minister Himanta Biswa Sarma said that Vajpayee was a friend of Assam and he supported the causes of Assam Agitation. Because of the former Prime Minister’s initiatives, the union ministries were mandated to spend 10 percent of their budget allocations for the development of North-Eastern region.